It was the name that got my interest, when I first heard of the book. Of course I had expected something unusual in the book, and it turned out to be the same. 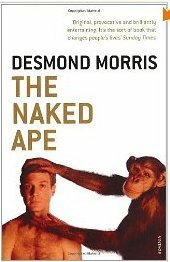 The Naked Ape is a non-fiction, brilliantly written book about our origin as an ape, and how the genesis of an ape’s life, societal traits, and biological phenomena is related to and with that of animals. It could be made clearer by the fact that author was a zoologist and one should expect detailed description of different animal’s living style, their feeding habits, their life cycle in fact one can get an idea about their culture with this book. The book is branched into sections analogous to the life of an animal or an ape. It started with explaining that how the ape could have been originated and its resemblance to mammals. It discussed the sheer difference between the two with examples and habits from the real life. It then moved ahead with explaining the sexual life in both apes and animals and explained the differences with justification. Author had also explained the development of ape’s culture, and what possible traits could have contributed in it. The best thing was side by side he kept comparing every detail with that of an animal, and that actually made the book all the more interesting. At the end he explained the anthropomorphic attributes of human beings towards animals. He had also briefly thrown a light on the increasing population decade by decade, and it’s could-be impact in the years to come. He had clearly pointed out that human being is not the strongest one and cannot control nature and the biological phenomena as per his need. No matter how hard he would try to live as per societal norms and in the controlled culture, but there are basic urges that are common to animals and humans which would automatically bring them to same level, and would create for both of them, as the time had seen, an equal position in this environment and world. Author in the entire book had been elaborative, and due to this reason the book had been banned in some parts of the world. The book was understood to be disgracing human beings and in some cases was considered as unworthy to read. However, respect, disrespect, worthiness and unworthiness of a thing is created by human beings and largely depends on an individual's view point, but the book only tried to explain the origin of an ape, reasons for its nature that we saw today in ourselves and its sheer comparison with animal life. The other good point of the book is it could be helpful for those who would like to develop themselves in body-language reading. It could add another dimension to their thinking pattern. On the whole, the book is worth reading for everyone and if you are a fiction-freak then it can also give you a good break from thrillers, love stories or sci-fi. Sounds like a interesting book and I would love to take a break from fiction. I never understand why people ban books. Also as you said I would look for it as I want to learn more about body language.